How to Design Light Weight Concrete? Mix design methods applying to normal weight concrete are generally difficult to use with light weight aggregate concrete. The lack of accurate value of absorption, specific gravity, and the free moisture content in the aggregate make it difficult to apply the water/cement ratio accurately for mix proportioning. Light-weight concrete mix design is usually established by trial mixes. The proportions of fine to coarse aggregate and the cement and water requirement are estimated based on the previous experiences with particular aggregate. Various degree of water absorption by different light-weight aggregates is one of the serious difficulties in the design of mix proportions. A reliable information of saturated, surface-dry bulk specific gravity becomes difficult. Sometimes the aggregate is saturated before mixing so that it does not take up the water used for mixing. The quality of concrete does not get altered on account of absorption by aggregate. It has been seen that the strength of the resulting concrete is about 5 to 10 per cent lower than when dry aggregate is used for the same content and workability. This is due to the fact that in the latter case some of the mixing water is absorbed prior to setting. This water having contributed to the workability at the time of placing gets absorbed later, thus reducing the bad effect of excess of water. 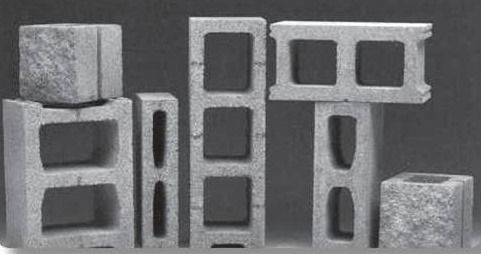 Moreover, the density of concrete made with saturated aggregate is higher and the durability of such concrete, especially its resistance to frost is lower. On the other hand, when aggregate with high absorption is used, it is difficult to obtain a sufficiently workable and yet cohesive mix, and generally aggregates with absorption of over 10 per cent are presoaked. Mixing procedure for light-weight concretes may vary with different types of aggregates. The general practice for structural light-weight concrete is to mix the aggregate and about 2/3 of the mixing water for a period upto one minute prior to the addition of cement and the balance mixing water. Mixing is done continuously as required for homogeneity. Usually 2 or more minutes are required to get uniform mixing. In case of some insulating concrete, the aggregate is added at the end of mixing to minimize degradation. Mix design data have been prepared for several, proprietary light-weight aggregates available in the United Kingdom. The parameters obtained from these charts cannot be taken as final answers. However, they may give information for first trial. Next Important Chart on Concrete factors like WORKABILITY, SLUMP & COMPACTING.